Hazards of Combustion Products: Toxicity, Opacity, Corrosivity and Heat – Fire Science and Technology Inc.
V. Babrauskas, R. G. Gann, and S. J. Grayson, eds., Hazards of Combustion Products: Toxicity, Opacity, Corrosivity and Heat, Interscience Communications Ltd., London (2008). viii, 356 pages, illustrated, hardbound. ISBN: 978-0-9556548-2-4. 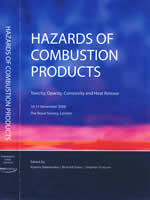 This is a reference book on the topic of toxicity and hazards of combustion products which was published in conjunction with a conference on the topic which was held in London during 10-11 November 2008. It is intended to be a reference work which lays out the state of the art for assessing the hazard of combustion products and the methodologies which are suitable for this purpose.